Almost a decade of austerity finds much of our NHS crumbling. Today, the fight to restore what was the best health service in the world was taken up by 10000 nurses, as they marched on London. Over the last decade, the Royal College of Nursing has seen a dramatic change in its approach to industrial action. Many of its members now take the view that only direct action will shift this government. The RCN has warned that unless the next Government drops the 1% cap on pay, it will hold a ballot on industrial action. 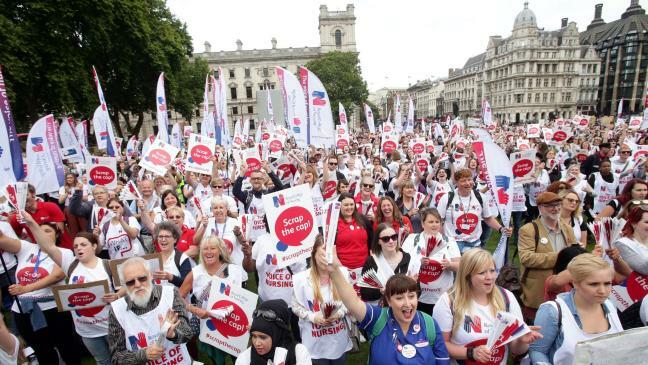 Earlier this year, members of the RCN voted overwhelmingly in support of direct action – nine out of 10 support action just short of a strike, while almost four out of five back strikes. This call to arms now needs to be taken up by all public sector workers, most of whom have suffered the same pay cuts for many years.